This is a tutorial on vector algebra and matrix algebra from the viewpoint of computer graphics. 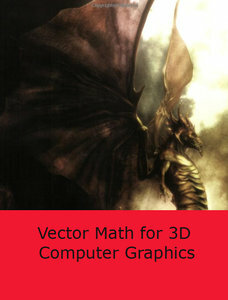 It covers most vector and matrix topics needed to read college-level computer graphics text books. Most graphics texts cover these subjects in an appendix, but it is often too short. This tutorial covers the same material at greater length, and with many examples. This tutorial is useful for more than computer graphics. Vectors and matrices are used in all scientific and engineering fields, and any other field that uses computers (are there any that don't?) In many fields, the vocabulary used for vectors and matrices does not match that used in computer graphics. But the ideas are the same, and reading these notes will take only a slight mental adjustment. These notes assume that you have studied plane geometry and trigonometry sometime in the past. Notions such as point, line, plane, and angle should be familiar to you. Other notions such as sine, cosine, determinant, real number, and the common trig identities should at least be a distant memory. Computer Graphics, 3D, Animation and Imaging, etc.